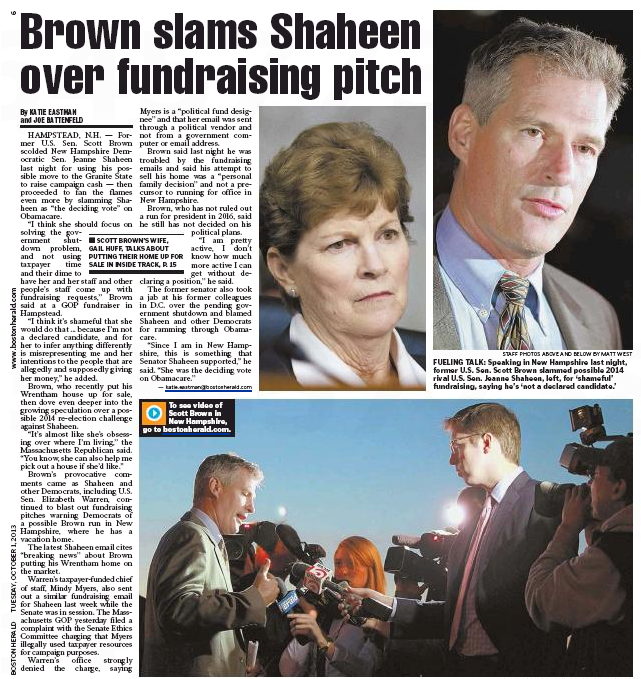 Boston Herald: What Can We Do for Brown? Our feisty local tabloid is a regular fanzine for former Sen. Scott Brown (R-Elsewhere). Yesterday he hit the trifecta in the Herald. Today it’s the daily double. 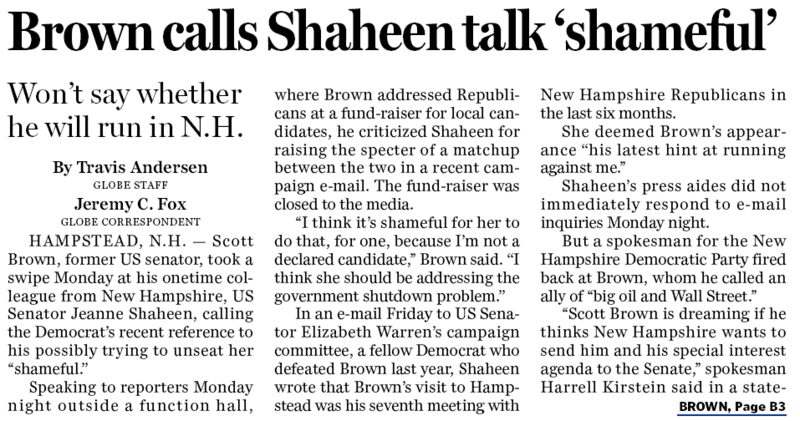 First he gets the full-page treatment in his burgeoning feud with New Hampshire Sen. Jeanne Shaheen (D-Fundraiser). The lede has Brown accusing Shaheen of casting “the deciding vote” on Obamacare. Oldest trick in the book: you can say the same of every one of the other 59 votes that got the Affordable Care Act passed. I think it’s shameful that she would do that … because I’m not a declared candidate, and for her to infer anything differently is misrepresenting me and her intentions to the people that are allegedly and supposedly giving her money,” he added. Ten bucks to anyone who can diagram that sentence. And, not to get technical about it, he meant “imply.” Fortunately for Brown, a firm grasp of the English language is no longer a prerequisite for high office. But wait – there’s more in the Boston Brown & Gazette. 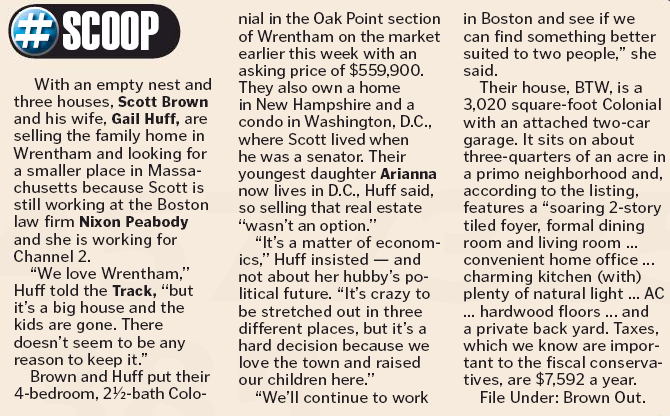 For the second straight day the Herald is acting as Brown’s co-broker in the sale of his Wrentham home. And they say newspapers don’t carry classified ads anymore. Crosstown at the Boston Globe, the story is less hyperventilating and doesn’t mention Shaheen deciding Obamacare. This entry was posted on Tuesday, October 1st, 2013 at 10:15 pm and is filed under Uncategorized. You can follow any responses to this entry through the RSS 2.0 feed. You can leave a response, or trackback from your own site.